The Great Wolf Lodge in Georgia is finally open and we have your first look at how amazing it is. Great Wold Lodge GA is located a little over an hour outside of Atlanta in LaGrange, Georgia. Check out our Great Wolf Lodge Georgia video tour below. We went to the grand opening celebration where Disney star Meg Donnelly helped Great Wolf Resorts CEO, Murray Hennessy introduce the new Wiley's Waterpark. Donnelly also help raise $14,000 for Make a Wish Georgia by riding all of the Great Wolf Lodge water slides. Meg Donnelly is the star of Disney's Zombies and ABC's American Housewife. She was challenged to ride all of the Great Wolf Lodge's water slides and the company vowed to donate $1,000 for each slide that she tested. The Make a Wish Georgia family also got to help open the park with them. LaGrange is the new home of the Great Wolf Lodge Georgia and the development in the area is going to be great for them. There are 10 places to dine, 7 places to shop, and 32 activities and attractions you can enjoy with your family! Check out the full tour of Great Wolf Lodge Georgia in the video below. You can also see Meg Donnelly in the grand opening celebration. The hard hat tour of the Great Wolf Lodge Georgia doesn't do the property justice. It is truly amazing to see the finished resort. I can't wait to take my kids to experience the resort first hand. 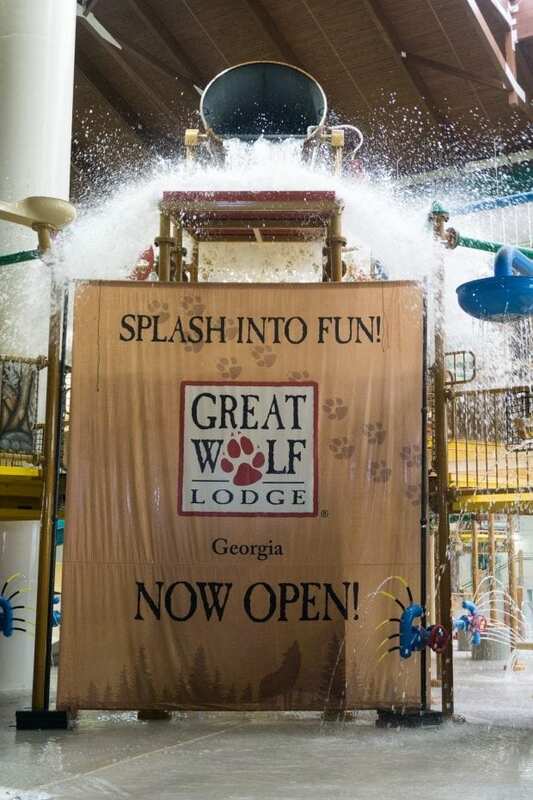 First, let's check out the attractions and great things to do at Great Wolf Lodge Georgia. Wolf Tail: Step into the launch pod and prepare yourself! Once the floor drops out from under you, and you’re hurled into a nearly vertical, 20-foot free fall, followed immediately by a 360-degree, high-speed loop. Triple Thunder: A thrill slide for group rafts that has two saucers and one funnel mixed in with quick twists and turns. Fort Mackenzie®: Multi-level tree house water fort that combines suspension bridges, treetop slides, swinging cargo nets and spray stations. The park’s signature tipping bucket dumps one thousand gallons of water every four minutes. Totem Towers: Five three-story body slides attached to Fort Mackenzie. Slap Tail Pond®: Gigantic wave pool complete with waves reaching up to three feet in height as they roll through every five minutes. Chinook Cove: Water playground for children of all ages featuring basketball and floating obstacles. Otter Run: A family-friendly body slide and a sure- re favorite, Otter Run is perfectly sized for small and tall alike! Big Foot Pass: Unique water obstacle challenges kids and adults alike to balance on floating logs and lily pads and hold on to hanging nets as they try to get across the pool. Crooked Creek: Winding lazy river. Cub Paw Pool: Zero-depth entry children’s pool with water fountain features and spray-and-play adventures. Whooping Hollow: This play pool is filled with perfectly sized water slides for young pups. Gentle slopes and tiny dips and turns make these the go-to attractions for the “under 48 inches” set. Rapid Racer: Two tube slides that are side-by-side for some friendly competition among groups. River Canyon Run: Twist and dip over this slide’s curves and bends with your whole pack on this family raft ride. Cabanas: Private cabanas are available for rent, which include a safe, mini-fridge, and the option of food and beverage service. What is cool about Great Wolf Lodge Georgia is that you don't have to stay at the resort to play. The waterpark is exclusive to guests and requires a wristband to enter, but the Adventure Park is open to the public. This includes our restaurants, shops, spas, and MagiQuest®! Northern Lights Arcade: More than 100 interactive video and redemption games that allow guests to redeem points for prizes. Howlers Peak Ropes Course®: An invigorating aerial adventure that has guests balancing on ropes, crossing bridges and climbing through obstacles: all from the safety of a climbing harness! Ten Paw Alley: Family-style bowling with pint-sized bowling balls. Oliver’s Mining Co.: Pan and sift to find the beautiful gemstones and minerals waiting to be discovered. Rustic Ridge Rock Wall: Rustic Ridge offers a 21 ft. climbing challenge for every age and skill level. Howl in One Miniature Golf Course: No family vacation would be complete without a round of miniature golf! MagiQuest®: Guests battle dragons, befriend a pixie and wave a magic wand in this live-action adventure game throughout the resort. The games features three unique chapters, each with their own challenges and quests. There is also an adorable show in the lobby they kids can sit down and watch. Don't forget about Camp H.O.W.L. Which will also have a childcare option so that parents can go have an evening without the kids. There are great themed rooms on the property as well. My favorite is the Kids Cabin Suite. They have their own little nook and it has bunk beds and a TV they can watch. The Grizzly Bear Suite has two bedrooms and a large living room area for bigger families to gather in. There are a lot of fun places to eat at Great Wolf Lodge Georgia as well. Barnwood is my favorite, it offers locally grown food and it was delicious. There is also a Ben & Jerry's Dunkin Donuts, Candy Company, Timbers Tacos, Buckets, and the Campfire Kitchen. The resort is already booking up! They have a full house for Memorial Day Weekend!